Mr. J. R. Atchison is a native of London and began his business career in 1867, as a clerk in the store of Auburn Smith, then the leading druggist of London. 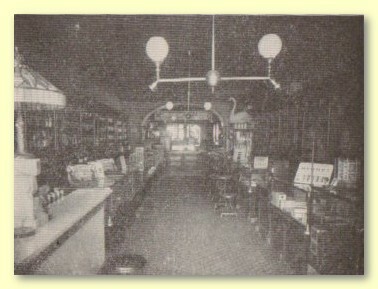 In 1872, Mr. Atchison opened the Toland Block Drug Store. In 1883, he purchased the entire interest of Mr. Smith and conducted the store with great success. Ten years ago he moved to his present location one door north, having now the finest, most spacious and most complete drug store in the county, occupying in its various departments nearly 5,000 square feet and reputed to have one of the largest stock of drugs of any store in Central Ohio. Mr. Atchison is prominent in other business interests, and for nearly twenty years has been secretary of the London Home and Savings company, the most successful financial institution in the county, and the largest loan company. During Mr. Atchison's secretaryship it has grown at a wondrous rate, and has never lost a dollar through loans or investments. Mr. Atchison has served as president of the council, member of board of education and a member of the board of county visitors. He is identified with the Masonic fraternity, and very popular with all who know him.